Discussion in 'Prius, Hybrid, EV and Alt-Fuel News' started by Tideland Prius, Jan 22, 2019. Now if they’d only start selling 2019’s in 2019 .
mozdzen, Leadfoot J. McCoalroller, scona and 1 other person like this. Ioniq PHEV would provide some competition but Hyundai continues to restrict supply here to a trickle. My parents picked up one a few months ago and really like it. Best selling but lukewarm reply with cold feet. Makes you wonder if 2019.5 or 2020 is in the works for some reason. yeah, one gets the feeling that manufacturers are not feeling the profit love. scona and TGrracie like this. Open Road Toyota Port Moody currently has zero Prius and eight Primes. When I was getting some bulk oil the service writer mentioned he was driving one, I assume loaner/demo status. Addendum: yeah at least $2K. I remember back in 2010 they first print out a bill-of-sale with Documentation "included". Then reprinted it and surprise surprise: $295. I raised a stink, and they took it off, muttering that it was highly irregular. I see in eight years or so that's morphed to $495, even stinkier. This is one of the cheap one, 40K CDN out the door. Just playing a mind game, I thought: what would I do, if the offer was our 2010, with 79K kms, babied, for a Prime, even trade? Outcome: I'd pass. 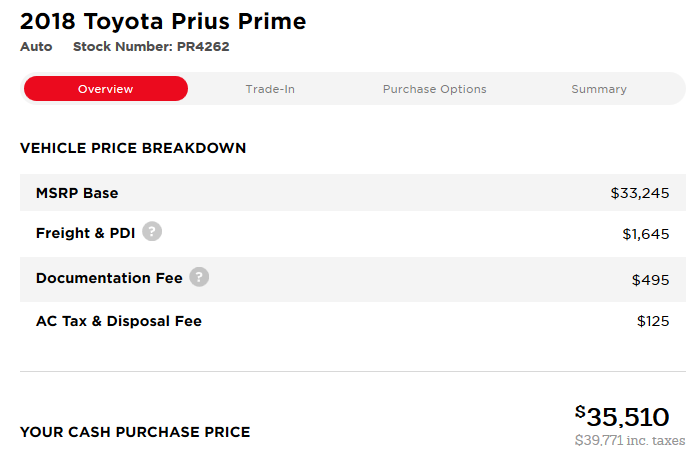 Officially, Toyota Canada no longer includes the documentation fee. Prior when we bought our 2010s, it was explicitly mentioned that it was included on toyota.ca, now it is not. It is set at $495. Keep in mind that that price excludes the $2,500 Clean Energy Vehicle rebate off the after tax total, so it’s $37,200. @bisco , some provinces have rebates. BC offers $2,500 for the Prime and Quebec offers $4,000. bisco and Mendel Leisk like this. Autotrader says 46 '19s and 732 '18s. Which one fines buyers? Ontario? lol... They had $7k off a Prime which was reduced to about $5k then the new Premier canned it. PEI offered rebates when hybrids where still a new thing but I don't think they offer EV rebates. Says 60 today, talk about an exponential delivery rate! ". . . in December 2018 . . ."
They also forgot about the EV range of the BMW i3-REx: "The Clarity PHEV is spacious for a plug-in hybrid. Additionally, its electric range is on the high side at 47 miles, which is only outdone by the Volt’s 53-mile electric rating." "Honda made monumental strides in 2018 with its Clarity Plug-In Hybrid. It outsold its number one rival — the Toyota Prius Prime — in October and December. Now, January brings another win for the Clarity PHEV. Based on official reports from both automakers, Honda sold 1,196 Clarity Plug-In Hybrids in January compared to Toyota’s 1,123 Primes delivered." Tesla Model 3 ramp up appeared to have leveled off Prime sales. Leaf took it on the chin. Yes the Clarity has improved its market share. Yet we have this curious phenomena that the Prime is not available in all regions.